Earlier today I was talking to my mom as I was scrolling through Twitter and reading her some of the #ThanksDave posts on Twitter in honor of the last episode tonight of The Late Show with David Letterman. At this point in my life, I don't know if I had ever focused on an episode of a late night show before. The jokes were always over my head, [Tangent: WHY IS THIS CLARENCE THOMAS COKE CAN GAG FUNNY!!??!] so I guess I found them useless and just continued to wish I was watching TGIF instead. That night was different. Not only did I watch my parents laugh hysterically, but I laughed, too. 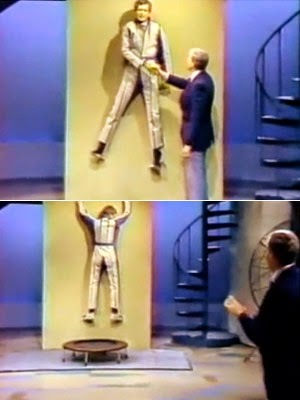 I remember them showing a clip of him wearing a velcro suit and stuck to the wall. It was so ridiculous that I can still picture it and how it was so stupidly funny that it bridged the generation gap between me and my parents. My mind raced with two thoughts: Who is this man? and OHMYGOD! This is the coolest job ever. I'll admit, I haven't been 100% loyal to Dave. In fact, when Conan took over for Leno [for that year that existed] that was my clear choice from 10:30- 11:30. And once Jimmy Kimmel moved his show up a half hour, that has been my default. However, Letterman was my first love and I'm slowly realizing it as I have teared up at almost every episode counting down to his retirement. [Tangent: Most blatheringly during Ray Romano's heartfelt Thank You and then again during Norm McDonald's stand up set. It was so touching that snot might have presented itself. I even teared up during a montage of Rupert moments on last nights show.] As stated in Steel Magnolia's- "No one cries alone in my presence", so it's highly likely that I will be crying with many tonight and thanking my mom and dad for instilling in me the important things in life. [Tangent:...and remembering how hard my dad used to laugh every time they played Will it Float?] Thanks, Dave!